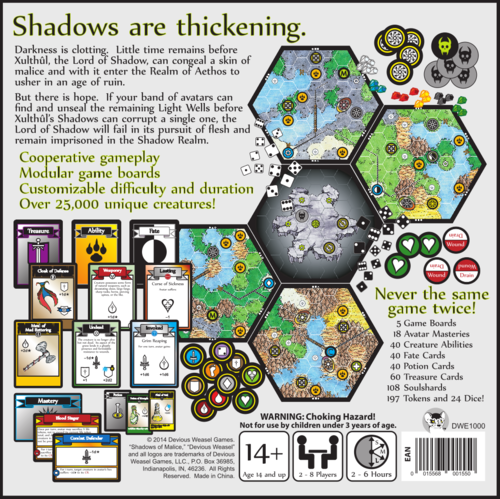 Shadows of Malice is a cooperative game in which 2 - 8 players work to unseal hidden Wells of Light to prevent the shadow demon Xulthul from gaining substance and overrunning the Realm of Aethos. The Wells are located in strongholds scattered throughout the Realm and defended by powerful Guardians. Over the centuries, many of the Wells have lost their Light and fallen Dark. If the players find and unseal all the remaining Light Wells, they prevent Xulthul from gaining substance and win the game. If Xulthul’s Shadows, however, manage to defile a single Light Well, the demon gains substance and enters the Realm. If this happens, the players must defeat Xulthul in battle to save the Realm. 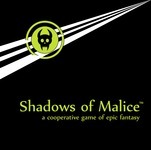 Add a Review for "Shadows of Malice"